Creatine is an endogenous substance (made by the body) that is present in every human cell. It functions as an energy storehouse. Creatine is required for physical and mental exertion. Supplementing creatine increases the amount of creatine in muscle tissue, providing increased energy for improved performance, faster recovery and increased muscle mass. - Official Creapure® Creatine made in Germany to the highest standards rather than other impure products. With 600g per bag you have 120 serves of creatine. Thats enough for two 90 day cycles! Creatine is usually taken over a fairly lengthly period, either with intermittent breaks or continuously. For this reason, the quality of the creatine should be an important consideration in selecting a product. Creapure® satisfies even the most discriminating consumer’s demands for quality, safety, and efficacy. 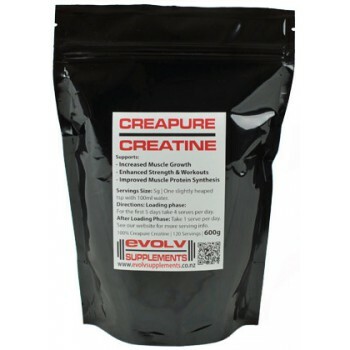 High quality and therefore safe creatine products bear the Creapure® logo. Therefore, the manufacturing conditions and the selection and handling of raw materials are crucial factors for determing the quality of creatine monohydrate. Single Serve: 5g or a slightly heaped teaspoon, mixed with about 100ml of water or your protein shake. - Mix it with other drinks like your protein shakes. - Can be taken at any time during the day. Loading phase: For the first 5 days have 4 serves per day. After loading phase: Take 1 serve per day. A good time to take it is straight after your workout with your protein shake. Creatine needs to be cycled on and off for the greatest benefits. After the loading phase take creatine for 6 weeks then have a 4-6 week break. #Note: Do not leave creatine mixed with liquid for too long as it will turn into creatinine which is useless to muscle. You are better to mix it straight before drinking. Its also better to keep Creatine stored in a dry place. Official Creapure Creatine, Made in Germany to the highest standards. Packed in NZ.